Mason jars give a shabby or country elegance to weddings. They’re affordable for use in centerpieces and have also become a mainstay in wedding decor. 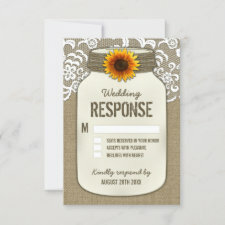 The above sunflower wedding invitations with matching RSVP cards and other products are designed with a vintage mason jar and text with a burlap and lace themed background. The top portion of the jar has printed twine wrapped around with a sunflower centered. Burlap and lace mason jar sunflower wedding invitations set. Country themed sunflower watercolor wedding invitations. Weathered barn wood wedding invitations with vintage paper and sunflowers. Rustic lights sunflower wedding invitations. These sunflower themed invitations features a vintage background with string lights at the top that glow. The sunflower flower is a vintage vibrant vector to stand out against the background. The font features a fun carved or scratchy appearance for uniqueness. The back is printed in the shade of black that is featured at the bottom of the front to match. Matching RSVP cards feature the same design elements with white check mark and response boxes. Sunflowers, lace and barn wood grace the above wedding invitations collection with rustic fonts for added decor. Pair your stationery needs with matching wedding or ceremony programs, favor stickers in various shapes and more. Programs and save the date postcards feature demo photos of a couple that you can change to a picture of your choice.